When we look back at 2009 it is going to be remembered as the year of the filly. Fillies and mares have dominated from coast to coast. So many of them have amazed us with dazzling performances that have dropped jaws and lit up speed figure charts. It would be absolutely extraordinary if a benevolent sponsor offered up an enhanced purse for the Beldame this year. Now is the time, the horses and the rivalry are here right now. NYRA/TVG have promised a million but there are million dollar races throughout the summer. This is a special occasion and it calls for a special race with a huge purse. Imagine a race that corralled all of the filly all-stars. What about the $3 million Ladies Classic at Santa Anita? It is just not the same on that synthetic surfaces especially without division leader Rachel Alexandra. This distaff classic has to be at Belmont and it must be on dirt. The star studded field of recent big winners would be Rachel Alexandra, Zenyatta, Icon Project, Seventh Street, Music Note and Careless Jewel. Let them fill out the field to twelve runners to generate maximum handle. There would not be enough words to describe the excitement that a race like this would generate. No Hangover at Power Cap as we picked our spots on the Travers card and have plenty of handicapping vigor left to take on Sundays card. We are looking for the weekend stakes double for Capt. Candy Man's trainer Ian Wilkes. His charge Miss Isella is the power filly in the Personal Ensign. Go back and watch this filly's replays. It is clear that she has the heart of a champion to go along with her talent. Twice at Churchill she determinedly bullied her through up a narrow opening and scored over a horse that had a much better trip. Willing to forgive the loss last time on the bog to the speedy Seventh Street. I figure it is going to take a huge performance from another contender or a disastrous trip to get Miss Isella beat today. She is the most likely winner of the day, hoping for 2-1 and some value in the exotics. Unfortunately this years Travers card is going to be deluged with heavy rain. The Travers looks wide open to me. This is the kind of race where I am going to approach with caution. It is beneficial to absorb the rhythm of the day before committing to one horse the night before. With conditions sure to be ultra-wet it is doubtful that even the graded stakes turf races will stay on the grass. The good news is I have a few mudders picked out that are sure to run well tomorrow at square prices. Capt. Candyman Can is going to win the Kings Bishop. He loves the mud and it will take a horse to freak like Quality Road freaked in the Amsterdam to beat him. Justenuffhumor is entered in today's Baruch handicap. He has emerged as the leading miler in North America. His form has been sensational reeling off 5 consecutive wins since moving to the turf. He is part of one is most success immediate families in racing with Lewis Michael and Champion Dreaming Of Anna both half siblings. His strength is his turn of foot. The interesting thing today is that he does not have a workout listed since his score in the fourstardave. This is not Mclaughlin's Modus Operadi. Justenuffhumor may be vulnerable today. If Justenuffhumor can run well today while he may not be at his best, he can solidify his claim as the only horse with a serious chance to beat Goldikova in the B.C. Mile. Old war horse Naughty New Yorker pushed past $1 million in earning today with his placing in the Funny Cide stakes at Saratoga. After a year layoff and a few last place finishes it looked like the old war horse would never get to $1 million, he has loomed over $1 million with about $980K in earnings since February 2008. He finally made it past the $1 million plateau with a better run today. Southside Babe was stymied on the rail in her last race and unleashed a furious late rally. There are no comments in the form outlining her trouble. We have a competitive field and along with the hidden trouble we may see the square 8-1 morning line on Southside Babe. We will need some racing luck, however I have little doubt that Southside Babe is live at 8-1. Not much speed signed on for the Troy stakes today. Sixthirteen figures to make the lead by employing his natural speed. The pace scenario looks doable as he only has to outgame True To Tradition on the front end. Sixthirteen makes the top every time and he has a really good chance at taking them all the way here. The horse's trainer Hushion has a history with these turf speed horse sprinters and can get them ready for this type of task. The 6-1 morning line would be a gift. After a procession of longshots it looks like logic will hold sway here. Banlock Banrock is going to win the West Point. DRF's Crist has a live ticket in the pick 6 singling Banrock and I am certain he will make it to the finale with four shots at pick 6 glory. Banrock has a huge class edge here combined with a versitile run style. Some of the best handicapping you will ever read is from Arlington Park's Joe Kristufek. He made made a huge score in the Sword Dancer. I overheard him touting Telling last week on my trip to Arlington. That is some of the best "telling" going when the horse scores and pays $68. If I had only taken the advice to heart I would be a rich man and could park the limo for the rest of the summer. Baghdad Equestrian Club doesn't look much different from the NYC OTB I cut my teeth in. Maybe the the secret to the secular/religious war for oil can be mitigated through horseplaying. Contact power cap for expert consulting. After my first visit to Arlington I can understand why Al Capone made the move from Brooklyn to Chicago. Not only was Chicago a helluva town but Arlington is a top-class racing venue and everyone I dealt with was helpful and professional. This facility was clean, modern and meticulously maintained. From the well landscaped grounds to the clean bathrooms and immaculate paddock everything looked like a classy facility, not just a great racetrack. I have to spot Arlington right under Keeneland as the number two racing facility in North America. Track had a majestic entrance gate, it looked like you were driving through an entrance to a stud farm or perhaps an estate. The grounds leading up to the clubhouse entrance were landscaped with an abundance of fresh flowers and just cut shrubbery. My $25 seat to the Arlington million not only provided a place to sit but also free parking, a program and track admission. The Arlington Million racing program is one of the premiere racing cards of the year in North America. If you a fan of turf racing, these are your kind of races. I posted a pick 3 that threw the kitchen sink at the sequence but failed to hit. Take The Points surprised me as I expected him to regress off tough races but did the opposite and ran a huge race under Desormeaux to take the Secretariat Stakes. This was the first time that Desormeaux had won a graded stakes for Todd Pletcher. The Aiden O'Brien shipper Black Bear Island ran well for second. Desormeaux collected a stakes double when Dynaforce stalked the pace a forget to quit in the Beverly D.
Before the Arlington Million the Brazilian bred Gloria De Campeao put on a show in the parade. For about 10 minutes he ran around with his head about one foot off the ground and cocked to left with his mouth wide open teeth exposed like a rabid dog. I don't know what he was doing but it didn't look like he had his mind on racing. This was a long way to come for a horse to go out and goof around on the track like a big baby. The classy and talented Gio Ponti solidified his position as the top turf horse with his forth grade I win in a row. He looked tremendous in the paddock and Clemente looked confident as he saddled him. Gio Ponti looked like he made the lead early at the top of the lane and might be caught late. However as soon as the competition came to him he found another gear and took off again. Gio Ponti won deceptively easily. This is a classy colt that will return for a five year old campaign. Arc de Triomphe 2010 for Gio Ponti? P.S. On the way home at O'Hare airport I met hall of fame jockey Gary Stevens on the Hertz rent a car shuttle. It was only the two of us on the bus. He was a really nice guy and was happy to talk about the races with a fan. Like Al Capone before me a Brooklyn born Mediterranean-American is heading to Chicago to make it big in gambling. Capone took over the Chicago underworld, I'm just looking to take in the sights and hopefully hit the all-stakes pick 3. The consensus is that Arlington is one of the best venues to enjoy American horse racing. After many years of watching the Arlington Million on TV and wishing I was there I have finally committed a summer weekend to visiting Chicago and attending America's best turf race. The highlight of the Arlington Million program is the all-turf all-stakes pick 3. American racing handle is down over $1 billion 7 months into the year. This is a steep decline off of 2008 which steeply declined from 2007. Instead of ringing the alarm and reaching for the slots lifeline to prop up the failing venues, racing should let the failing tracks close. We have market forces trying to "right size" the racing industry, but rather than let the natural forces transform racing into a healthy industry we have the racing industry pushing back with slots. Instead of a healthy and fit industry we have a slew of uninteresting tracks and an industry too large to maintain. Last year 54,000 races were run in North America with $14 billion in handle. In comparison Japan ran 3,400 races and had $28 billion in handle! While most Americans are not going to bet like the Japanese it would be better if racing allowed the market forces to shape North American racing like JRA racing; reducing the amount of races and increasing the quality. In Japan every racecard is an event, here in North America other than a few boutique meets every race is like another endless spin of the roulette wheel. At many venues few people watch or wager on the action; the races denigrated into a pseudo-welfare distribution event for slot revenues. There will be some pain as the industry "right sizes" but it is vital that American racing becomes healthy. No wasteful corruption laced government programs are needed to manage racing, it is just a question of letting the market close tracks and concentrate the fields at the successful venues. Rather than "right sizing" the game we have racing continually subsidizing low quality short fields with slots. These races pull horses from successful venues and the handle is not relative to the purse. Slots are going to be the slow death of racing. Too many races with too many horses spread out at too many tracks. With all of these tracks the competition is severely diluted. Also with this slot-based artificially augmented demand for horses there is nowhere to retire the horses when their racing careers are over. Even with all of this baggage being lugged around racing still holds it weight and outgames other sports in TV rating for the triple crown events. Racing still has a sizable niche market and since it is a unique sport there is always the potential that racing could take off as tastes change. Racing will never have the chance to reach the mainstream if it can not "right size". These starter allowances are all about class. Lost Without You has almost won two stakes and drops down to a starter allowance. She is in form and loves these turf sprints. She is the play of the day. Jim Squires, the Pulitzer Prize winning Chicago newspaper editor-turned- horse breeder who bred 2001 Kentucky Derby winner Monarchos at his Two Bucks Farm goes sour on racing in his book Headless Horsemen a take of Chemical Colts, Subprime Sales Agents, and the last Kentucky Derby on Steroids. Squires takes on the powers in racing in what has the potential to be a popular book. Squires echoes the popular sentiments on what ails the industry often shared on the internet. As a noted industry progressive Squires advocates more government regulation, more transparency and less drugs. While the book is long on complaints and short on solutions it is an informative must-read. Squires is not afraid to go after people in high places. There is no doubt that racing has been crashing in key economic indicators and the crash in the "sales horse" segment of the industry has hit Squires' breeding operation hard. Handle is down, way down and the last few Kentucky horse sales have seen precipitous declines in all indicators. Squires links this crash to the "Bush Economy" and states that the horse industry has popped its own subprime bubble just like the real estate market and the stock market. The first and most frequent target of Squires' ire are the so called "Dinnies" The "Dinnies are the blue blood industry leaders surrounding Ogden "Dinny" Phipps. They are repudiated as steering a ship that is “void of leadership and rudderless.” At every turn new ideas in racing are annexed as the "Dinnies" own creations. Time after time progression is killed by committees filled with the "Dinnies" personally appointed puppets and cronies. A good example is the Major League Racing tour that was proposed a few years ago; the idea was funded but died in committee before a horse could be nominated to one of the races. As a former member of the Kentucky Racing Commission, Squires has solid insider connections. Squires describes a web of insiders, loathe to government involvement who are in charge of an industry that is out of control. Powerful yet powerless the "Dinnies" have a tight hold over racing and have presided over a steep decline in all areas of the industry. Squires provides a good insiders account of what happens behind the scenes at the NTRA and Breeders Cup. Squires pulls no punches on the usual group of industry targets and even goes after some industry legends with sterling reputations. He goes after oft suspended trainer and easy target Richard Dutrow citing his record of drug suspensions. Michael Iavarone from IEAH stable is exposed yet again as a two-bit boiler room cold caller who got lucky with Kip DeVille and Big Brown while parleying that success into a subprime horse hedge fund. Squires suggests that a legendary red horse acquired his robust physique through the use of anabolic steroids. A particular thorn in Squires side in Indian Charlie, the satirical industry newsletter that Squires has been a frequent target of. One particular point of contention for Squires has been the "sale horse". As a breeder of a Kentucky Derby winner Squires has the requisite resume to tackle this issue. Squires contends that drugs, surgery and two year old under tack sales have taken the Kentucky thoroughbred from being a sturdy, classic horse to a fragile drug addicted animal built to sell but not necessarily to race. He makes excellent points and opens up an important debate on the affect of the breeding shed on racing. One of Squires key issues is the required x-rays that Keeneland sales have mandated on all horses entered for Keeneland auctions and how those x-rays disqualify otherwise good horses that have gone on to be successful. There is some irony that the man who would introduce transparency and more regulation into the horse racing business is negatively affected by the unintended consequences of the regulations mandated by the auction house meant to increase transparency. His contention is that breeders are aiming to breed the perfect horse but the perfect horse is not necessarily the best horse. Squires provides the example of how Curlin had a defect in his ankle when he went to auction and how this imperfection enabled trainer Ken McPeek to acquire Curlin for a bargain price. Horses that are not born perfect are being made perfect through surgery and drugs, often to their own detriment. Squires own breeding operation has been hurt as horses with off-set knees and various other conformation defects have been met with disinterest in the sales market. Squires own aversion to drug and surgery conformation correction in yearlings has rendered his foal crop unmarketable. Squires and Two Bucks farm have to compete against other foals that are chemically and surgically altered specifically with the sales auction in mind. Now with the sales market bubble burst what will Kentucky do with all of those unprofitable horses? My suggestion would be to race them, but the long lag time from the day the mare is covered to the day the horse collects the maiden purse(if they are lucky) makes this impractical for many. Squires seems to suggest regulating the thoroughbred horse market from Washington. One day the hope is to force breeders to market natural horses. With chemically or surgically enhanced horses out of the picture, clean operations like Two Bucks farm can sell on a level playing field. After taking on the sale horse Squires goes after the world of sales agents. The theme here provided by Squires is "Shenanigans" Squires exposes a world where friends make false bids on horses to inflate their value. Then the false bidders are rewarded with backdoor payments after the sucker bidder has been reeled in. This is a world filled by horses with secret and silent owners. Handshake deals are allowed and the unregulated sales house regularly fleeces newbies. While most victims quietly exit the game after being scammed; Squires tells the tale of "The Righteous Brothers" who refused to go quietly. Satish Sanan along with Jess Jackson and how they fought back against the corrupt agents with lawsuits and made inroads on increasing the transparency of the sales auction arena. As much as Squires assails the industry he praises cowboy trainer Larry Jones. The Squires have hired Jones as their own trainer. Squires dedicates an entire chapter detailing Larry Jones and his wife Cindy. It is a good account of a honest, self made man and how he was attacked from all sides after the 2008 Eight Belles breakdown. There is an intriguing story of the 2008 first medication positive for a Two Bucks Farm runner. It was also the first medication positive for a horse trained by Larry Jones after 27 years practicing his craft. Squires bemoans a the testing process that has marked him as a cheater and a hypocrite. Squires makes his case that he was framed in a bid to silence him as a reformer and progressive. Headless Horsemen is the now book for 2009. The numbers reveal that the market for horses has shrunk considerably. The sale horse is becoming unprofitable for all but a very few foals. Wagering is down umpteen percent. Squires states that this is the worst position that horse racing has been in for a long time. The time for change is now. Squires has a very negative outlook on horse racing, but those who think that central regulation, less drugs and more transparency are the ticket will agree with Squires' take on the industry. It it vital that these issues are being discussed by someone with the credentials of Mr. Squires. For anyone in the game; Headless Horsemen is a must read. Welcome to Monday madness at the spa. This is the day that wacky things happen at the old spa. Huge longshots and unlikely results from the graveyard of favorites. Rarely do I list two plays of the day from one card but today I like two horses in consecutive races. Rather than have to chose between two loves I decided to go dutch and share the love. Call it pari-mutuel polygamy. With these two horses running in consecutive races the doubles/pick 3's/pick 4 become live wagers for me. Either horse in not necessarily a single on every ticket but certainly a key horse that dominates the majority of wagers entered. 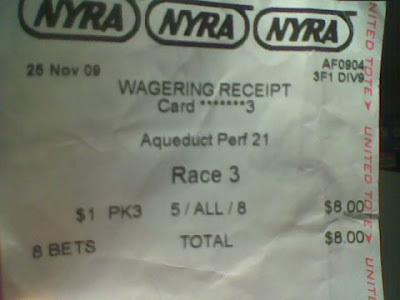 Saratoga Race 8 Amsterdam Stakes 6 1/2F Grade II 3Y.O. Mr. P.C. has been chomping at the bit the bet against the likely odds-on favorite Quality Road. Between the hoof injury, the layoff, the cutback in distance and the barn change; this colt has too many variables in-flux to expect a win. I am going to toss the Florida Derby winner from the win frame. A horse I like here is Capt Candyman Can. He has a great stalking run style, plenty of speed and the birds eye post position on the outside. I also like that blowout workout on Saturday morning. Candy looks primed to run a big race and should provide value along with four legged speed. Saratoga Race 9 Tap The Admiral Stakes 1 mile inner turf 3 Y.O. Love the speed and inside post on #1 Royal Vindication. This colt could go wire to wire here on the inner turf from the rail post. He is so fast that the others will likely relinquish the lead and assume that the distance will draw him back to the field. With Royal Vindication loose on the lead there is a likely possibility that he will never relinquish the lead. We are looking for a wire to wire victory in the Tap The Admiral. If Royal Vindication can get the job down we will likely tap into some nice summer brews. The race that many of these horses emerge from is the Don Jack Stakes. That race was won in wire to wire fashion by Sal The Barber who is significantly slower that Royal Vindication. I feel the front is available for Royal Vindication and he has the speed and skills to wire them. Top threat to ruin Royal's party is Strike Again who we will be using a bit as well. All week I have been chomping at the bit to play Big Drama in the West Virginia Derby. We had the lone speed, the tremendous weight break and the short field all playing to his advantage. Then we had that fact that the field is filled with no-hope race fillers and the tactically disadvantaged Mine That Bird who figures to be 3-5 or less in here. At the height of the Bag Drama fever I even considered tapping into a savings account to increase the investment on Big Drama. It all seemed too good to be true for Big Drama who should be somewhere between 8-5 and 2-1 but would be 1-2 on my personal oddsline. Then a stranger weighed in poured cold water on my Big Drama crush. The very generous Amateur Capper has shed some light on Big Drama's form cycle. You have to love it when a capper has the stones to weigh in on these races before they spring latch and Amateur Capper provides a compelling argument. A.C. provides solid reasons why Big Drama may have some health/form issues. He has given me reason to pause. As far as capping goes this is as good as it gets. However after thinking it over I am going to forge ahead with playing Big Drama in the West Virgina Derby. The bet will be spread across the pick3, late daily double and win pool. His four workouts in the last few weeks smooth over any lingering issues that A.C. has touched on. This is either going to be a case of my first instinct being correct or an example of a player not being able to pass on what looks like winning hand despite hints of looming disaster.